Springfield’s Taryn Freer beats out a throw from Beavercreek pitcher Mariah Crawford to first baseman Hannah Walters in the first inning of Monday’s April 8 girls high school softball game at Rotary Park in Beavercreek. Beavercreek’s Maddie Neibert (17) beats the throw to second for an RBI double in the fourth inning, April 8 at Rotary Park in Beavercreek. Springfield won the game, 7-5. The entire Springfield team greets Wildcats infielder Lydia Vlcek (4) at home plate after she crushed a line-drive home run over the centerfield fence in the third inning of Monday’s 7-5 Springfield win over host Beavercreek. Beavers freshman second baseman Shelby Metzger catches a fly ball in the sixth inning of Monday’s 7-5 loss to visiting Springfield. 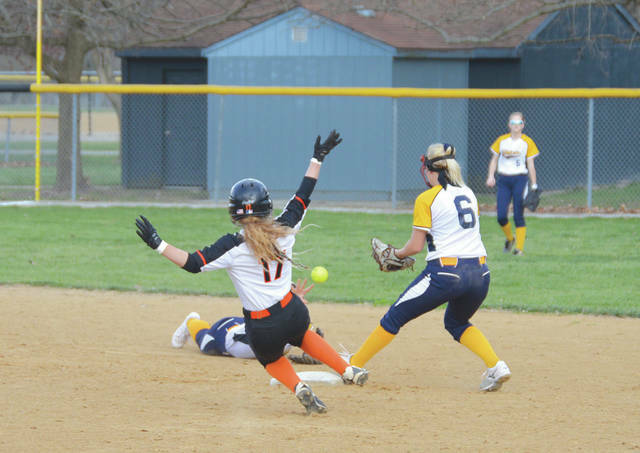 BEAVERCREEK — On the one hand, Monday’s home loss to Springfield provides Beavercreek coach Paul Martin and his staff a good teaching tool on what his team needs to do to win high school softball games. On the other hand, class will be back in session Tuesday against the same solid Wildcats team. 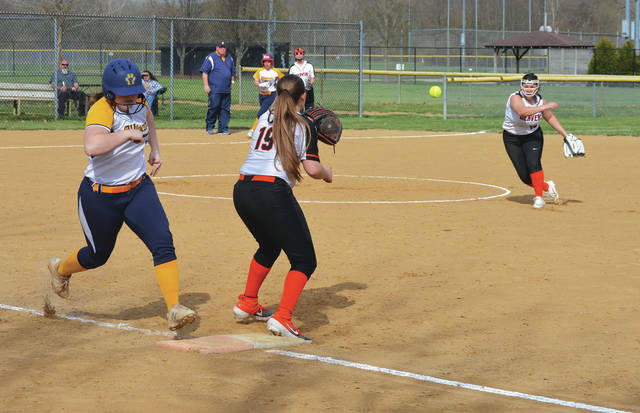 Springfield charged out to a 6-0 lead, then held on for a 7-5 win, April 8 at Beavercreek’s Rotary Park. Springfield scored first on Kirsten McCleary’s sacrifice fly which scored lead-off batter Kenzie Burkhardt in the top half of the first inning. The Wildcats added three more runs in the second, with Burkhardt, Lydia Vlcek and Annmeri Turner each scoring on a two-RBI double by Taryn Freer and a single by Burkhardt. Vlcek then unloaded a line drive home run over the center field fence to score two more Springfield runs in the third. With pinpoint accuracy, she hit the only car parked beyond the fence. Freer, who is currently listed in the top-5 among Greater Western Ohio Conference batters in average (fifth, .667) and home runs (second with three) scored Burkhardt with the ‘Cats final run in the top of the fourth inning. Burkhardt and Freer, the 1-2 batters in the Wildcats lineup, combined for five hits, three runs and three runs batted in. Jackie Grayson was the only other Springfield batter with two hits in the road win. 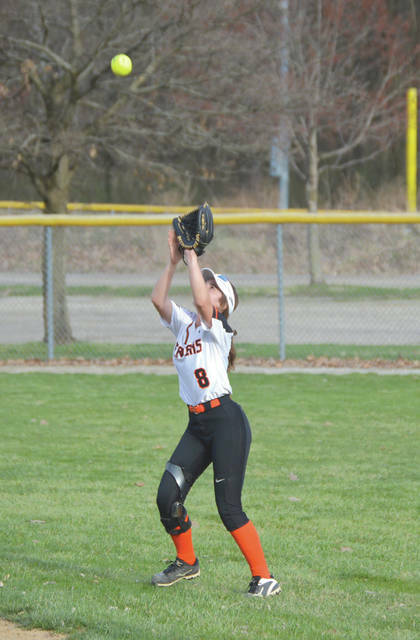 For Beavercreek, Alyssa Lewis and Shelby Metzger both had two hits in Monday’s loss. Maddie Neibert doubled, drove in a run and scored another; and clean-up hitter Mariah Crawford knocked in two runs on an RBI double. Senior catcher Hannah Walters drew three walks on three at-bats. Wildcats junior pitcher Bailey Romine held Beavercreek hitless over the final two innings of play. Sadler wanted to recognize Vlcek’s third-inning homer. 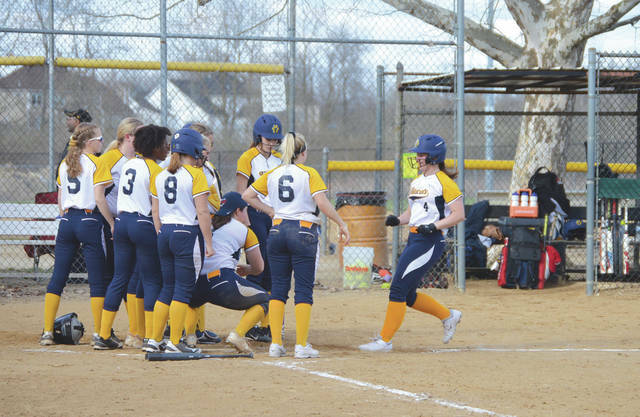 Vlcek bashed a grand slam in a recent weekend win over Stebbins, too. The two GWOC East foes will get back at it at 5 p.m. Tuesday with a game at Springfield High School.